Any trip to a famous city would not be complete without a Sunday afternoon browse around a museum, especially if it houses particular treasures. Of course all art is subjective, but there are some things you really have to see and others that just catch your eye and imagination. The Israeli Museum sits below the watchful eye of the Knesset, the Israeli Parliament and the site is spread over some 12 acres, so with limited time it was important to choose which exhibitions to visit. The white domed building was originally built in 1967 to house the first seven scrolls discovered at Qumran in 1947. It shapes represents the shape of the lids of the jars in which they were found, and is constantly sprayed with water from the fountain to keep the dome and the rooms beneath it cool. Inside the cave-like building, in dimmed light are examples of the texts dating from the third century BC to the first century AD, most of which are written in Hebrew, a few in Aramaic and Greek. Most of the texts were written on parchment and only survived as fragments, but despite this scholars have been able to reconstruct about 950 different manuscripts. One manuscript, the Isaiah Scroll (Manuscript A) written around 100BC is the only biblical scroll from Qumran that has been preserved in its entirety – 734cm long, and a facsimile is displayed around the centre. Toward the end of the First Temple period, the Jewish people began to shape their ancient traditions into holy scriptures and thus became known as ‘the People of the Book’. Outside is a model of Jerusalem recreating the city of 66AD, at the time of the Second Temple at the height of its glory, on the eve of the great revolt of the Jews against the Romans. Made out of stainless steel there is a warning not to touch the piece, indeed the heat could be felt just by standing near to it. Inside the Fine Arts exhibition there was one picture that really caught my eye, not necessarily because of its content, but the amazing green sheen that the artist had created for the dancer’s dress. ‘OK, let’s boycott it’ and ‘It’s nothing to do with me.’ I think that’s too easy. Also inside is his infamous ‘Sunflower Seeds’ (2010). When it was originally exhibited at Tate Modern in 2010 you could walk across the 100 million porcelain sunflower seeds, each one painstakingly sculpted and painted by hand. However, this constant disturbance created a health risk from the dust that was kicked up. Here in the Israeli Museum the installation was still vast even just walking around the edge. every great house he burned down. The medium chosen for the image however was Lego Bricks. When Weiwei decided to use Lego bricks he received a letter from the company refusing to sell them to him because they were unwilling to collaborate in a political work, therein demonstrating that censorship was alive in the West as much as in China, through large corporations undermining individual freedoms. However, after posting their response on his Instagram thousands of people from all over the world send him small individual supplies. Of course there were a million other things I could have taken pictures of but time was running out and a one point I did find myself walking in and out of so many different galleries trying to find the exit that they became a bit of a blur – such is art. This entry was posted in Ministry and tagged Ai Weiwei, Anish Kapoor, antiquity, art, china, Cultural Revolution, Dead Sea Scrolls, Dropping a Han Dynastry Urn, Egardo Sambo, Iron Tree, Isaiah, Israeli Museum, Knesset, Mao, Maybe - Maybe Not, Mike and Doug Stern, People of the Book, Qumran, Sunflower Seeds, Tate Modern, Teddy Kolleck, The Shrine of the Book, Tree on November 4, 2017 by lindasgalvin. The days are passing quickly now, flurries of letters and documents are being exchanged to ensure that everything will be in place for my ordination. College work is being completed and deadlines met. It is now less than nine weeks before I stand before the bishop and make my vows that will admit me to holy orders and I when I will become a deacon. Ordination traditionally takes place during Petertide or Michaelmas. 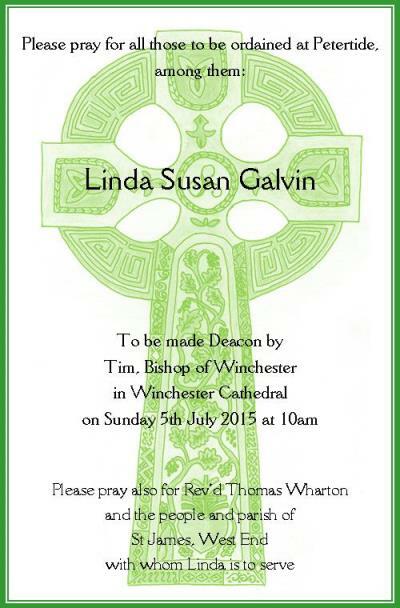 In Winchester this happened at the former time on the Saturday and Sunday nearest to St Peter’s Day (29th June) and this year it will be over the weekend of the 5th-6th July. As the time approaches I become more aware that whilst this has been very much a personal journey I have been uplifted and supported by a whole host of others, not least through their prayers. During the church year, there are special periods set aside for prayer and fasting, some of these are known as Ember Days or Weeks, when prayers are sought and offered for all those preparing for ordination and for the parishes and people that they are being sent to serve alongside. Often, these requests are in the form of Ember cards, that are made and given to friends, family and congregations – a handy aide-memoire. 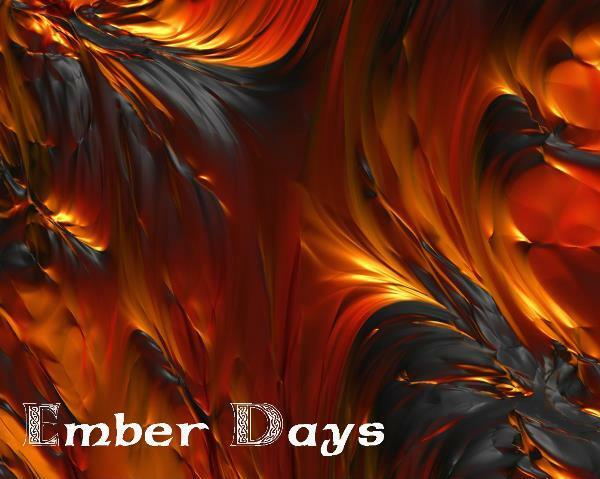 This entry was posted in Ministry and tagged celtic cross, deacon, ember, Ember Cards, Ember Days, Ember Weeks, fire, God, Grace, holy orders, Holy Spirit, Isaiah, Jesus, John 15:16, Michaelmas, ministry, ordination, Petertide, prayers, vocation on May 4, 2015 by lindasgalvin.